Do you feel like you never get enough sleep? Do you feel just as tired whether you sleep 6 hours or 14 hours? Things that used to be fun – even just hanging out with friends – are now a chore. You’re tired – exhausted even. And you can’t seem to break out of your funk. You’re not able to think straight and your wit and humor seem dormant. The only thing you can trace it back to is an increase in stress, due to an increase in responsibility (in work or in your personal life). You tried to manage it but the weight of your responsibility made you even more stressed. And you became more and more drained. And now, you’ve reached this low point. So what’s going on in your body that’s causing you to feel this way? Why aren’t you able to deal with the stress and function well like you used to? Well, the answer has to do with your immune system. Your immune system employs armies of white blood cells to ward off enemy invaders (outside harmful agents that enter your body with destruction in mind). There are 3 major types of white blood cells: natural killer cells, B-cells, and T-cells. When you become stressed, a hormone is released into your body that reduces the amount of each of these white blood cells in your body. That means that more of the harmful intruders get through to cause their destruction. At first, your immune system rallies the remaining troops and fights back. But, over time, the reduction in forces slows it down. And the effect of these harmful agents begins to be felt. You get tired and have less energy – you’re weaker. But there is something you can do to help your immune system rally – take AvéULTRA. Right now, you’re stuck in a downward spiral. You’re stressed which makes you weak which – in turn – makes you more stressed. But if you’re able to give your immune system a helping hand, you’ll become stronger and have more energy, which will make you less stressed – you’ll begin to climb your way back up that spiral (if, at the same time, also reduce some of your outside stress!). 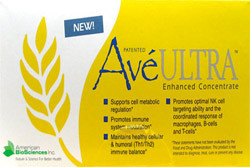 AvéULTRA with its primary natural ingredient – fermented wheat germ extract – is that helping hand. Alone, each white blood cell type performs a different function at a different time. And sometimes, they’re not in synch. This problem is exasperated when stress reduces the overall number of white blood cells. When you take AvéULTRA, it synchronises the white blood cells – making them work together in perfect harmony so they can take a last stand against the big evil army of intruders. And, when working together, they’re able to take back your body. Basically, it optimizes your immune system which will help you feel better and more energized. When you have more energy, you’ll be less stressed and have more fun – which will strengthen your immune system even more – and in a natural way. Hence, the upward spiral of increased energy you’ve been hoping for. So don’t waste time. Break the cycle. Help your body take back your energy.